Vegan cookie dough is the best because it can be eaten raw, no questions asked. These truffles are up there with my favorite things to make and eat! I adjusted my chocolate chip cookie recipe by leaving out the baking powder and baking soda and figured out how to make truffles all by myself. Line a baking sheet with parchment paper. Make sure the sheet can fit flat in your freezer! Using a 1 tablespoon ice cream scooper, make dough balls. Freeze for a half hour. Take the dough balls out of the freezer. You will need a plate, a fork and 2 spoons. The challenge here is that the frozen dough balls freeze up the chocolate so I had to figure out a way to keep the coating process separate. Spoon out some chocolate and drop it onto the plate. Roll the dough ball in the chocolate to cover it using the other spoon and fork to roll it back and forth. If you need more chocolate, drop some more in. Don’t put the cold spoon into the chocolate. Place the truffles back onto the baking sheet and when they are all done place them in the freezer for another half hour. Try to wait at least a few minutes before eating them. Enjoy! Love that cookie dough. Your truffles look delicious! thank you karen! they are super easy. Hurricane activity. 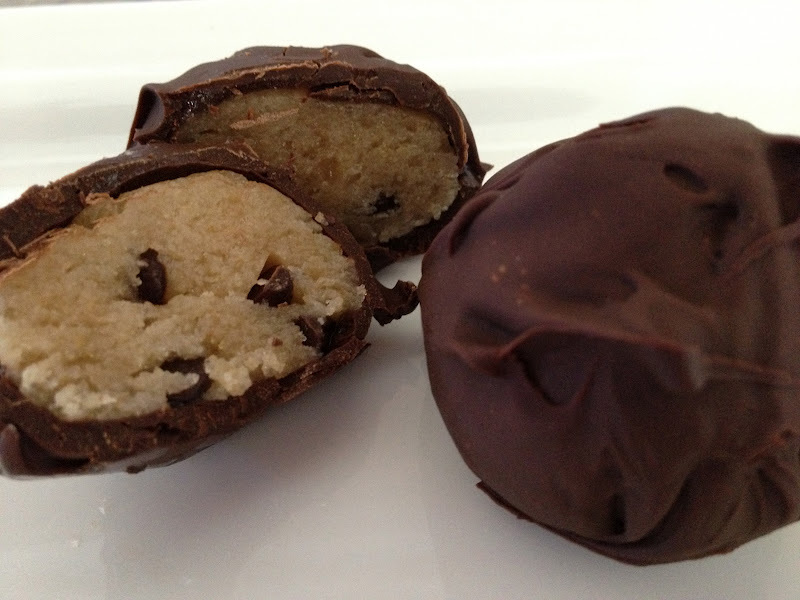 Cookie dough truffles made by 4 kids. Perfect and delicious!